Travelers around SE Asia had consistently told me “go to Penang, the food is amazing”. As my bus pulled into the terminal in Penang, my taste buds were ready for this culinary experience. I was not disappointed. George Town (the capital city of the state of Penang, where I stayed), delivered on its tasty reputation, and offered a whole lot more too. Walking through Penang’s capital city George Town is walking through a mixture of former British colonial architecture, Asian culture, and modern city bustle. Once one of Britain’s Straight Settlements, George Town is now a cultural capital and UNESCO World Heritage Site situated on an island in the north western Malaysian Peninsula. You can find a rich mix of Indian, Chinese, and Malaysia culture here, with the backdrop of a British colonial era. It is a culinary destination for many, as all three of these cuisines can be found in top form. The city also has a playful side, with interactive street art throughout. In the 1780s, when the Dutch East India Company began to dominate the spice trade in the East Indies, England did not want to be left out, and knew it needed to establish a presence in the area. Additionally, England wanted to keep in check the French colonization in the area. The British East India Company identified Penang Island as a strategic location for these initiatives as well as a place to facilitate trade with China and India, while serving as a naval repair base. In 1786, the company nominated Sir Francis Light to establish the company’s presence and relationship with the island. At the time, Penang Island was part of the Kedah Sultanate, which was vulnerable to Burmese and Siamese invasions from the north. The British East India Company played its classic move to take control of the island. Light brokered a deal with Sultan Abdullah Mukarram Shah in which Penang Island would be ceded to the British East India Company in return for British military protection. On August 11th, 1786, the Union Jack was raised on the island, signifying the possession of the island by the British East India Company. Fort Cornwallis was erected in the location where Light first set foot, and the settlement was called George Town after King George III. George Town was established as a free port, attracted traders from Dutch ports to the region. In a creative way to attract immigrants to the settlement, Light fired silver coins into the jungle. The policies worked – the number of vessels coming into George Town increased from below 100 in 1786 to nearly 4,000 in 1802. Its population increased to over 10,000. In 1826, George Town was made the capital of the Straights SetTtlements, which also included Malacca and Singapore. The population continued to swell, leading to typical challenges of cities at this time: sanitation, inadequate urban infrastructure, and public health, among others. World War I and World War II both brought battles to the island. In WWI, a German ship sank two Allied warships off the coast of George Town, in what became known as the Battle of Penang. In WWII, Japan indiscriminately bombed the city, which resulted in an estimated 600 deaths and 1,100 wounded. The bombing and subsequent Japanese occupation led to a British abandonment of the island, and also covertly evacuated its European population, leaving Penang’s Asian population to fend for themselves. Historians believe that this evacuation marks the loss of the British sense of invincibility. The period of Japanese occupation is infamous for the Japanese’s massacre of George Town’s Chinese population. George Town’s harbor was also used as a U-boat base by Nazi Germany. Starting in 1944, the British and US repeatedly bombed George Town, destroying many colonial buildings, including the Penang Secretariat, Britain’s administrative building. When Japan surrendered in 1945, Britain regained control of the island. Post war, George Town became a part of the Federation of Malaya in 1948. Malaya gained independence in 1957, and Penang became one of its 13 states. In 2008, George Town was inscribed as a UNESCO World Heritage Site, along with Malacca. Strolling Through the Streets and Eating! George Town is a fun place to be a pedestrian - the streets are wide, there are sidewalks, and there's no shortage of street food vendors and little shops to explore. After centuries of trading with India, there's an authentic Little India area where you can get a ton of curry for just a few bucks. I tried some curry and a salt lassy. For the uninitiated, lassy is a thick yogurt drink. I've had sweet fruit lassies before, but never salty, so I had to try it. Yuck! I quickly ordered a mango lassi. 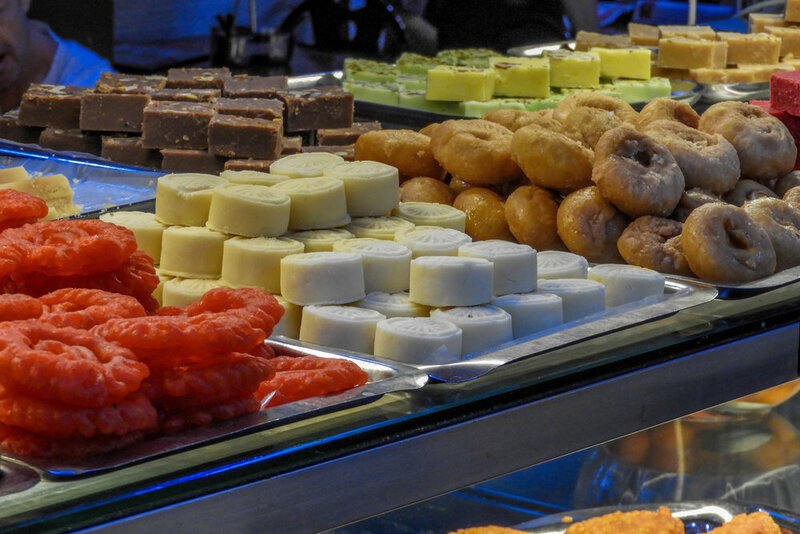 The Indian desserts were also a favorite. And since George Town is right by the water, there is fantastic sea food. I had one of the best sea food meals I've had in all of SE Asia. Fresh crab, prawn served in pineapple, spinach, and hot tea with juniper. There are also tasty buffets. This whole plate of food cost about $4 USD. This dessert is called ABC Ice. It's shaved ice with some sweet syrup, red beans, corn, and whipped cream. 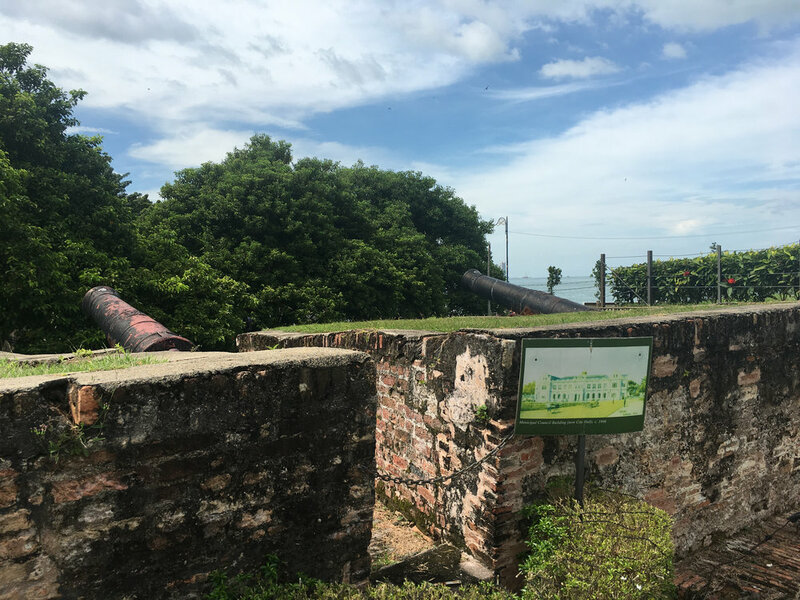 This fort was built shortly after Francis Light arrived to George Town in 1786. Originally built to protect the island from pirates, the fort went on to serve more as an administrative building than a defensive one. I woke up one morning and read an email from my mom, who said she just watched the television show Indian Summer. She was excited to let me know that it was filmed in George Town, where I currently was. It was filmed in an area called Penang Hill. With no set plans for the day, I decided to find this Penang Hill. I was determined to get there the local way, so I followed my hostel owners instructions to the nearest bus stop. I waited at this bus stop for at least half an hour. The bus finally arrived, and I went on-board as the only white person among the Malaysian locals. After about 45 minutes on the bus, I saw a massive temple on a hill. According to maps.me, the map app on my iphone, the temple is close to Penang Hill. I decided to get off and explore the temple. 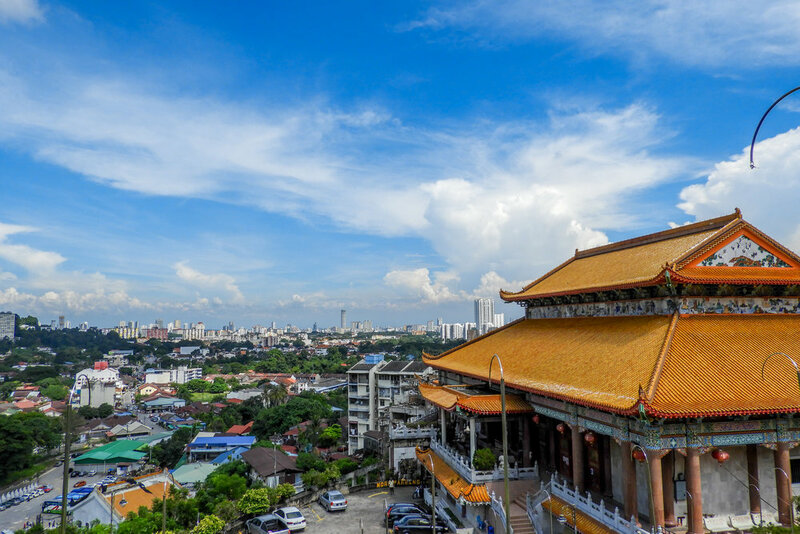 It turns out that it is the largest Buddhist temple in Malaysia, built over a period from 1890 to 1930, and named Kek Lok Si – Temple of Supreme Bliss”. 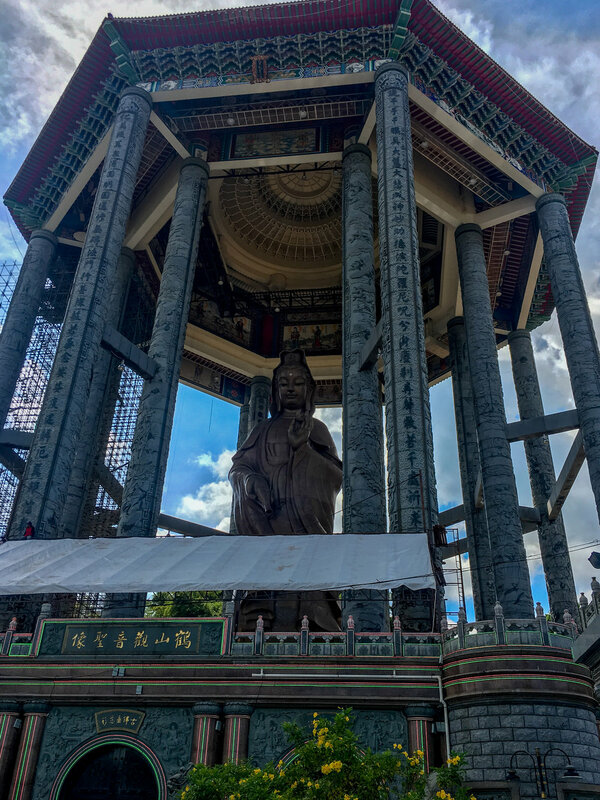 The complex includes 10,000 Buddha statues and a massive 99 foot tall statue of Kuan Yin, the Goddess of Mercy. As I would soon find out in Thailand, Laos, and other SE Asian areas, this temple is unique because it blends Theravada, Mahayana, and traditional Chinese architecture. This was a fun temple to explore. To get there, I first walked through a long tunnel of tourist-ey vendors, which led to a little pond with a ton (literally hundreds) of turtles! 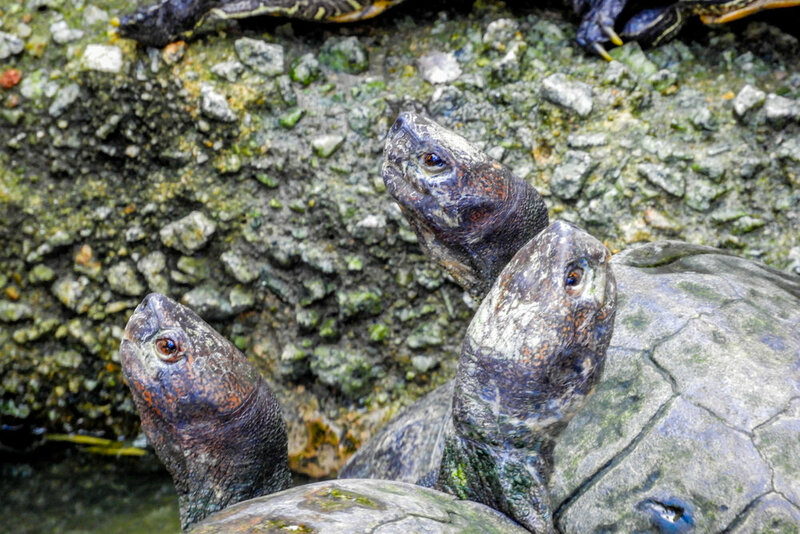 Following the turtle area, there was some more stairs, which led to an ornate Buddhist temple with beautiful views over both the mountains and the city of George Town. This temple is only the second to highest part of this whole complex. In the back of the temple, there is an elevator that runs on about a 45 degree angle up the mountain, to the area with the 99 foot Goddess of Mercy. I took the lift up with a bunch of Chinese tourists, and explored. The area offers some more fantastic views of George Town and the mountains, and also has some nice gardens and a koi pond. Unfortunately, you can’t drop your fish in the koi pond. Following Kek Lok Si Temple, I walked down to the road to a bus stop, to get to my final destination - Penang Hill. No one was at the bus stop - not a good sign, but I waited. Someone else sat down, then another person, then a group of people. Safety in numbers, I thought. Well, after at least an hour, the bus came, and everyone got in. But the bus, and everyone who was waiting, was going back to George Town! This was not my bus. Even though everyone said Penang Hill was a far walk, I couldn't wait any longer, so I started walking. And guess what? It only took me about 20 minutes! The mountain is the highest point in Penang, reachig 2,694 feet. The hill was one of the first places to get developed by the British. Francis Light commissioned the area to be cleared to grow strawberries, and hence for years it was called Strawberry Hill. Its official name, however, was Flagstaff Hill. 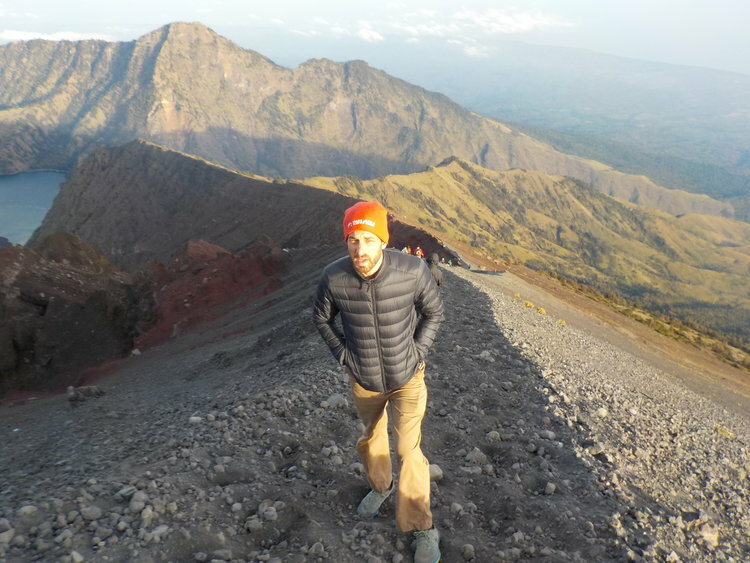 For over a century, the only way to the top was through hiking or a horse. In 1921, a "funicular railway", or a railway moved through a pulley system up a steep cliff, was built. This is the easiest way to get to the top. To get tickets, you need to wait in a big queuing area. The ticket I got cost RMI 30, or about $6.82. Stepping off the train, there's a noticeable change in climate. While George Town and the Penang lowlands are hot and muggy, the air at the top of Penang Hill has that cool and crisp mountain air feel. There are tons of tourists, but that's okay, because the views are awesome. You can also see some interesting things such as a Hindu temple, some old colonial buildings, and the Penang Hill Post Box, one of the first post boxes in Penang, probably built in the 1840's, and still used today! There are also golf cart-like vehicles to take you on a 20 minute ride around the mountain and see some more sights. I hired one, and I didn't see a ton, but it was fun to sit down and take a ride around. During the ride, we saw some black monkeys. These are different than the nosy macaques that are all around SE Asia. These black monkeys stay high up in the trees and are shy around humans. The driver also pointed out the area where Indian Summers was filmed.